I've eaten some things for breakfast that aren't generally considered breakfast. Well, not to me. I'm not counting non-traditional stuff that was because my schedule was all screwed up from working late. Pizza, of course. Cake. Peanut butter sandwiches. Peanut butter and jelly mixed in a bowl because I was out of bread. Chicken cacciatore -- that was an Army thing, and it was all out unit had for like three weeks in Kuwait, and I have not eaten it since. But now, I'm going to add Taco Bell to my list of out of the ordinary breakfasts. Only, it won't be. No really. Out of the ordinary, I mean. Taco Bell is offering breakfast starting 27 March, according to their Website. And it looks pretty good. 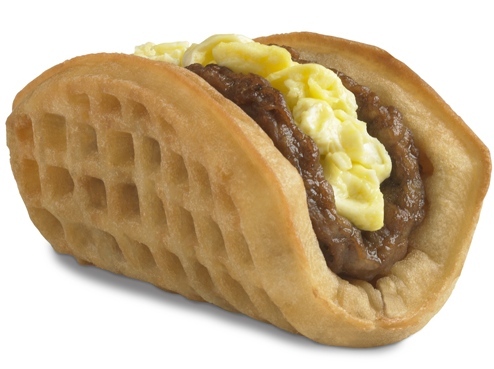 First thing I'm going to try is the Waffle Taco. That's a Waffle. With Sausage. And Eggs and Cheese. Folded like a Taco. The only thing missing is Bacon. Can they pull it off? I don't know. I've had breakfast at some places that just don't know how to make breakfast. Mostly in Kuwait or in Canada -- Niagara Falls, if you must have an explanation as to what I was doing in Canada -- but I'm thinking I've had breakfast in the U.S. that I didn't like. Somewhere. I hope Taco Bell lives up to the promise. If they don't, I hope they get deported back to where they came from: Downey, California. The AM crunch wrap looks promising too. Breakfast not new for Taco Bell. I used to get their sausage and egg burritos all the time. I can relate to the Army tray pack chicken cacciatore for breakfast. One of my Army National Guard Annual Trainings we had tray packs for breakfast and supper, MRE lunch, and we had chicken cacciatore for about half the meals and most of the rest were chili con carne. I think we had one breakfast tray pack but that was for supper of course. I can't get past the thought of a good waffle next to greasy sausage. Maybe it's because I make waffles from scratch and they deserve to be alone on a plate with butter, maple syrup and blueberry compote. Mmmmm. Except my homemade waffles are best with homemade raspberry or Blackberry jam. I'm driving nearly 1000 miles today. Is that close enough? I can't leave; I'm pruning fruit trees - later in the season than normal, all because of this lousy winter. So, you're returning home to Old Man Winter which apparently is coming back with a vengeance! So, I now officially have SPRING FEVER! Potatoes! Asparagus! Spinach! Beets! Dirt that isn't mud! I'm on my way to Alabama right now. Got a granddaughter playing softball this evening. Of course, Alabama is literally just over the bridge (I can see it from work). But there's a lot more to it, I understand. I spent the last ten days there for a wedding. It was gorgeous. The ceremony was in Atlanta. 60s. Blue skies. Light breeze. I planned the whole thing, but could never believe that the reception could spill outside... In February. I'm still reeling from the absolute beauty and perfection Providence shared with us. Daffodils. Trees in blossom. Birds singing. Like Eden. How was the softball game? They had fun. That was the important thing.